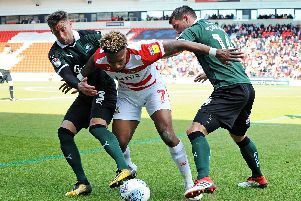 Darren Ferguson has pointed to a stand-out statistic to try and highlight how Doncaster Rovers have not gone far wrong in League One this season. Rovers are currently one of only three sides outside the top six to boast a positive goal difference (+1). Ferguson said: “When you look at the league I think it tells a story that, outside the top six, there’s only us and two other teams that have a plus goal difference. “That tells a story that we’ve been very close in games. Ferguson acknowledged the importance of victory against Bradford City on Monday night - particularly with his side not in action this weekend. Rovers are six points clear of the drop zone. “I felt Monday was a big game,” said Ferguson. “In my own mind I was thinking if we could get a win it would really set us up for the last nine games.